News - Armstrong Stands Behind Every NL-B Permanent Lifting Magnet - Armstrong Magnetics, Inc. Permanent lifting magnets are costly. They are in the range of hundreds or even thousands of US dollars. If they are out of order after a few years of use, that is not only a significant financal loss, but also lost time in your work or production. For majority of the permanent lifting magnets currently sold on the market, the product warranty is one year only. The worse case is that some of the vendors have neither the ability to repair the lifting magnets they sell or replace any damaged ones with new parts. 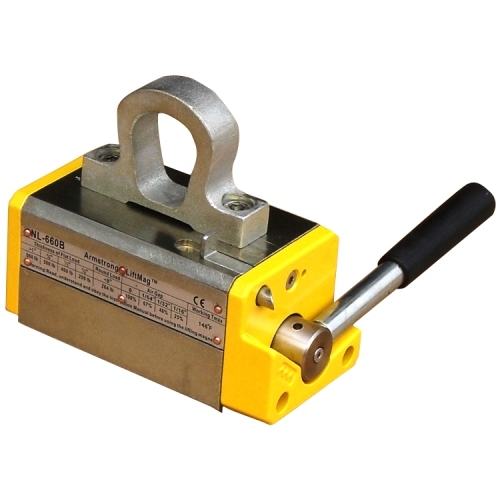 Armstrong Magnetics designs and manufactures NL-B permanent lifting magnets and provide each of them sold after 1/1/2016 with limited lifetime warranty. Lifetime means 10 years for NL-B lifting magnets according to the nature of this product and typical harsh industrial working environment. During this period we take full responsibility to repair the NL-B lifting magnets or supply any parts for replacement, due to defects in the materials or workmanship, with no any charges. In case that the damages of the NL-B lifting magnets are not caused by the defects in materials or workmanship, or the NL-B lifting magnets have been used for more than 10 years, we still provide repair and replacement services at low cost and make them function like new. As for after-sale service of NL-B lifting magnets, Armstrong Magnetics stores up all of the parts of NL-B lifting magnets for replacement in Bellingham WA and we have breakaway force tester for recertification of the NL-B lifting magnets after repair.